“The Company You Keep” (2012 production, 2013 release). Cast: Robert Redford, Shia LaBeouf, Julie Christie, Susan Sarandon, Nick Nolte, Richard Jenkins, Sam Elliott, Chris Cooper, Jackie Evancho, Stanley Tucci, Terrence Howard, Anna Kendrick, Brendan Gleeson, Brit Marling, Stephen Root, Gabrielle Rose. Director: Robert Redford. Screenplay: Lem Dobbs. Book: Neil Gordon. Web site. Trailer. Attorney Jim Grant (Robert Redford) leads a busy life. As a committed public interest lawyer and single father of an 11-year-old daughter (Jackie Evancho), he maintains a modestly comfortable, moderately visible profile in Albany, New York. That stability quickly evaporates, however, when an acquaintance, Billy Cusimano (Stephen Root), informs him that a friend needs legal counsel for an impending high-profile case. Although initially interested, once Jim learns who the would-be client is, he abruptly declines the inquiry, citing a full case load and a personal inability to provide an effective defense. Billy is understandably mystified, given Jim’s accomplished professional reputation, but the reluctant attorney has his reasons, none of which have to do with his case load or his legal skills. 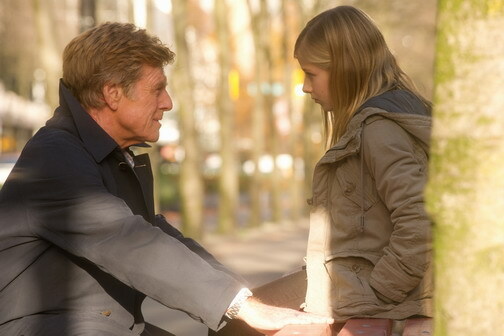 Public interest attorney Jim Grant (Robert Redford, left) cares for his 11-year-old daughter Isabel (Jackie Evancho, right) while trying to protect a 30-year-old secret in the absorbing new thriller, “The Company You Keep.” Photo by Doane Gregory, courtesy of Sony Pictures Classics. 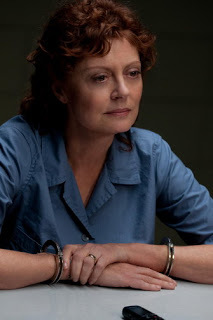 Rather, Jim’s decision hinges on the client’s identity, former ʼ70s antiwar activist Sharon Solarz (Susan Sarandon). As a member of the radical, sometimes-violent protest group known as the Weather Underground, Solarz was implicated in the death of a security guard during a bank robbery sanctioned by the organization 30 years earlier. She had been on the run and in hiding since then and was recently captured while en route to turning herself in. Jim’s hesitation has nothing to do with the nature of the case, but it has everything to do with the defendant, who turns out to be an associate from his own activist past. Taking the case would thus force him out of hiding as well, revealing his true identity as Weatherman Nick Sloan, a fellow suspect wanted in the bank guard’s death. 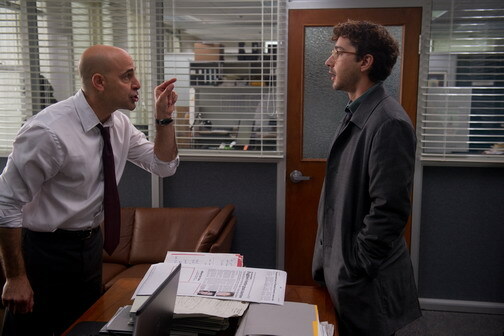 When word of the arrest surfaces, newspaper reporter Ben Shepard (Shia LaBeouf) is assigned to cover it by his editor, Ray Fuller (Stanley Tucci). As an aggressive investigative journalist, Ben jumps on the story. He begins by compiling background information, thanks to a lead provided by an FBI source (Anna Kendrick). Through that tip, Ben learns that Jim declined to take the case and decides to find out why. In a supposedly off-the-record interview, Jim anxiously reiterates his reasons for turning down the representation request, but Ben is not satisfied with the seemingly evasive answers he receives. He decides to look into matters further, but the focus of his investigation shifts from Solarz to Jim. And Jim, suspicious of Ben’s motives, knows that the journalist is onto him. While researching the story of a lifetime, investigative journalist Ben Shepard (Shia LaBeouf, right) frequently locks horns over procedure with newspaper editor Ray Fuller (Stanley Tucci, left), the one who gave him the plum assignment in the first place, in director Robert Redford’s “The Company You Keep.” Photo by Doane Gregory, courtesy of Sony Pictures Classics. Fearing that the truth of his real identity will come out, Jim (i.e., Nick) quietly vanishes into the shadows. He places his daughter in the custody of his brother Daniel (Chris Cooper) and embarks on an unexplained, but seemingly purposeful cross-country journey that reunites him with a number of his former operatives (Nick Nolte, Richard Jenkins, Julie Christie, Sam Elliott), all the while dogged by both Ben and by the lead FBI investigator on the case (Terrence Howard). Meanwhile, Ben also stumbles into a related story involving the police chief responsible for initiating the original investigation 30 years earlier (Brendan Gleeson) and his adopted daughter (Brit Marling). How it all plays out depends on how effectively Nick manages to stay ahead of those pursuing him – and whether the real truth of things manages to surface, for things aren’t always what they seem to be. Beliefs, as conscious creators know, provide the foundation for the “truth” we each experience, and they’re examined from a variety of perspectives in this film. For example, what we think of someone forms the basis for our experience of that individual. Those who believe Jim/Nick to be a criminal, for instance, employ those notions to create circumstances that paint him in that light. After all, some might contend, if he were indeed innocent, why is he hiding? So the belief that he must be guilty of something automatically arises among those who buy into that idea, and they consequently manifest a reality in line with that thinking. However, circumstances indicate that there might well be something more going on here. The fact that Jim chose to become a public interest lawyer – one who’s interested in seeing justice done – and that he somehow managed to successfully slip under the radar in realizing that goal suggest that he has a mission to fulfill, despite whatever he may or may not have done in his past. By specifically engaging in a profession that itself embodies the concept of justice suggests that he’s pursuing the fulfillment of a principle very near and dear to him, and his beliefs align with the reality he’s created for himself. Suddenly, the unquestioned belief that he’s guilty of something seems much less clear-cut than it might have at first glance. When fugitive Sharon Solarz (Susan Sarandon) is arrested while en route to turning herself in, she sets in motion a chain of events with implications far more sweeping than anyone could have imagined in director Robert Redford’s engaging new thriller, “The Company You Keep.” Photo by Doane Gregory, courtesy of Sony Pictures Classics. Beliefs related to ethics and ideology also play a major role in the picture’s narrative, and, accordingly, they impact both the events that transpire on screen as well as those that make up the characters’ back stories. The realities that spring forth from the beliefs that underlie one’s ethics and ideology can take myriad forms, ranging from what many of us would consider “reasonable” to those that we would likely see as “extreme.” While most of us might justifiably look upon such characterizations as patently “obvious,” we must also bear in mind that, in conscious creation terms, such distinctions disappear, because the philosophy maintains that all probabilities are valid and equally capable of materialized expression, no matter what they entail. Now, this is not to condone all of the manifestations that are capable of arising; the acts of violence carried out by the Weather Underground members depicted in this film, for example, are morally unsupportable. But, to keep manifestations like this from materializing again, it’s important that we understand what gives rise to them. By doing so, we have an opportunity to appreciate how they arose – and to discover why the beliefs that spawned them went awry. As author and conscious creation proponent Jane Roberts wrote (in conjunction with her noncorporeal channeled entity, Seth) in The Individual and the Nature of Mass Events, idealistic beliefs carried to their extremes sometimes morph into unbridled fanaticism. In such instances, “noble” intents that go perpetually unaddressed eventually reach the point where their associated beliefs take on exaggerated forms, transforming into perverted expressions of their original conceptions. Once again, this is not meant to suggest that such distortions should be sanctioned. However, if we were to take time to understand – and address – the issues (and underlying beliefs) that give birth to them before they explode in such inflated forms, we significantly increase our chances of curtailing their materialization. By doing so, not only can we stave off potentially needless tragedies, but we can also look to solve the problems that prompted their manifestation in the first place. Of course, being able to understand the beliefs that birth such extreme measures requires us to expand our own vision, to broaden our own perspective, to contemplate other viewpoints that we might not have previously considered. As conscious creators are well aware, we all have an infinite range of probabilities available to us, so embracing a mindset that allows for wider consideration of the spectrum of possibilities enables us to examine them more readily. That notion is raised repeatedly throughout the film, and it’s significant for a variety of reasons. For starters, it speaks to the question of judgment and whether it’s employed fairly or unfairly in assessing others and their circumstances (especially where Jim/Nick is concerned) by both those on- and off-screen. It also relates to the degree of discernment we draw upon in making such assessments, a consideration that sheds light on the importance of actively developing and making use of our intuition as part of the evaluation process. The picture draws particular attention to these matters in the context of generational belief differences, highlighting the distinctions between them. Because of differences in age, wisdom and life experience (and the less than fully developed beliefs that tend to accompany such qualities among those of fewer years), Ben is sometimes quick to judge the subject of his investigation. His limited knowledge of the period in which Jim engaged in his alleged acts prompts him to develop beliefs – and to manifest conditions – reflective of such thinking. By contrast, Jim’s presence in Ben’s life is to expose him to beliefs of a more seasoned nature, to help enlighten him about the events of the past, as well as to help him develop a more open mind, an attribute that will ultimately aid him both personally and as a journalism professional. His more mature approach to life serves as an example that his junior colleague can look to for inspiration, especially when it comes to the formation of beliefs where matters of ethics, honor, and personal and professional integrity are concerned. The need to accept the personal responsibility that comes with the formation of our beliefs (and the realization of the creations that arise from them) is also apparent throughout the film. This is particularly true for manifestations of significant magnitude. Jim and his former associates, for example, must come to terms with their past actions, owning up to what they did (or failed to do) and how those deeds affected everyone they touched (including, interestingly enough, each other). Likewise, Ben must be aware of the impact of his reporting, for covering a story is ultimately about more than just getting the scoop, a principle that many contemporary journalists have lost sight of (both for better and worse) and that the picture doesn’t hesitate to point out. When newspaper reporter Ben Shepard (Shia LaBeouf, right) stumbles into the story of his career, he diligently seeks background information from the FBI investigators (Terrence Howard, left, Anna Kendrick, middle) handling the case in “The Company You Keep.” Photo by Doane Gregory, courtesy of Sony Pictures Classics. The degree to which we accept such responsibility often rests with our sense of personal honor, with how honest we are with ourselves. Being true to ourselves (and our beliefs) is the hallmark of an effective conscious creator, one who operates with a sense of integrity and whose manifestations ultimately have meaningful impact. But those who betray themselves must be prepared for the consequences that accompany such actions. Those who doubt themselves or who knowingly engage in acts that are considered illegal, unethical or wrong will eventually pay a price, no matter what “justification” they draw upon for participating in them, as some of Jim’s colleagues – and foes – find out the hard way. Those who are faithful to their convictions, however, can be confident in their creations, never having to second-guess themselves, their beliefs or their actions. Even those who facilitate seemingly “deceptive” acts can be assured that they’re doing the right thing, provided that they are free of any doubt about their words and deeds. The integrity underlying such actions becomes evident for all to see, making favorable outcomes – even ones that include forgiveness as part of the equation – possible. “The Company You Keep” is an engaging, thoughtful thriller that holds audience attention well from start to finish. Its well-paced storytelling effectively maintains viewer interest throughout, revealing its plot elements in deftly measured increments but without unduly stringing audiences along. It’s easily Redford’s best directorial work since “Ordinary People” (1980) and a picture that’s more relevant for today’s times than the subject matter might initially suggest. Of course, the film wouldn’t have come off as well as it does were it not for its positively stellar cast, one of the best assembled ensembles I’ve seen in a long while. As capable as Redford and LaBeouf are in the lead roles, though, the supporting players are the real stand-outs, particularly Christie, Nolte, Jenkins, Tucci and, most especially, Sarandon. Their efforts are effectively complemented by a great soundtrack and gorgeous cinematography. Former ʼ70s radical Mimi Lurie (Julie Christie) is one of many members of the Weather Underground who must come to terms with her past in the “The Company You Keep.” Photo by Doane Gregory, courtesy of Sony Pictures Classics. The beliefs we hold and subsequently employ in materializing the world around us have wide-ranging implications that we would be wise to consider carefully. That applies not only in what we do, but also in how we assess what others do, for appearances don’t always tell the entire story. “The Company You Keep” shines a bright light on such notions, providing us with an illuminated perspective that goes beyond surface features to reveal the truth that lies beneath. Copyright © 2013, by Brent Marchant. All rights reserved.